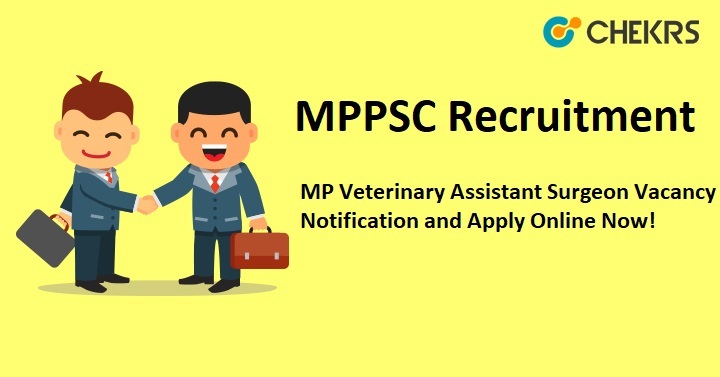 MPPSC Recruitment 2018: The Madhya Pradesh Public Service Commission (MPPSC) has been announced the PSC Recruitment Notification for the Veterinary Assistant Surgeon Post. Candidates who are currently searching for latest Madhya Pradesh Jobs can apply for MPPSC Recruitment 2018 to fill 188 post. Interested and eligible candidates are advised to apply before the last date and also check the eligibility, Education, Age Limit and other details from here. Click on the notification link named MPPSC Recruitment. Save and take printout of application form for future reference. Remarks: Madhya Pradesh Public Service Commission (MPPSC) has released MPPSC Recruitment 2018. Therefore to receive latest updates on Upcoming MPPSC Vacancy visiting our site www.jobs.chekrs.com. Our portal we provide you precise details of MPPSC Upcoming notification. In terms of any query or review we welcome your valuable comments in the commenting section below and we will get in touch with you shortly.